Aoife McDermott is a Reader in Human Resource Management at Cardiff Business School, where she coordinates the Cardiff Health Organisation and Policy Studies (CHOPS) research group. She is a trustee of SHOC, the learned Society for Studies in Organizing Healthcare. Her research concerns service delivery and improvement through people, in professional service contexts. She is particularly interested in change management and human resource management. Aoife received a BA (mod) in Business & Sociology from Trinity College Dublin, where she was awarded a gold medal. She completed her PhD as a Trinity Scholar and a Government of Ireland Research Scholar. She then worked as a lecturer in Dublin City University, before joining Cardiff Business School. Aoife's work has been published in Human Resource Management, the International Journal of Human Resource Management, the British Journal of Management, Public Administration and the Journal of Public Administration Research and Theory. Aoife is particularly interested in managing professionals. 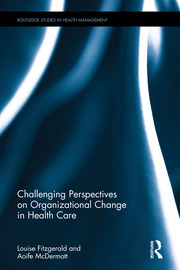 Recent work has considered change agent and recipient capacities for, and responses to, change, and the role of people management in shaping/responding to these.